The Top UNESCO-listed Attractions in South America are a spellbinding collection of historical, cultural and natural wonders. Combined, they represent all that is so revered about this continent: from the amazing wilderness brimming with unique wildlife to all the ancient cultures that have shaped human evolution on our planet. 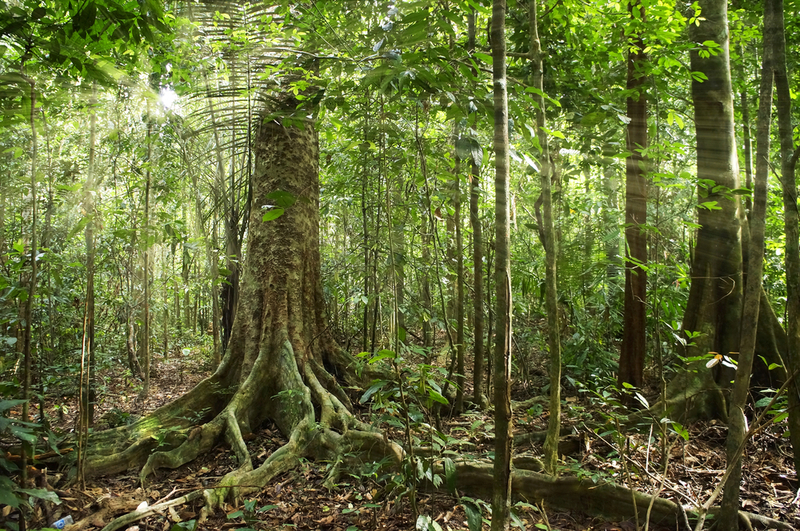 The Lush Rainforest in the Amazon. Photo credit: Shutterstock. It is not for nothing that the Amazon Rainforest is in this list of top UNESCO-listed Attractions in South America. The Central Amazon Conservation Complex is the most known UNESCO natural wonder in Latin America, and revered for providing much of the essential oxygen and fresh-water our entire planet needs to survive. One of the most biodiverse regions on earth, and home to its second-longest river (the homonymous Amazon River), this region is bursting at the seams with unique wildlife and offers one of the most unforgettable travel experiences you, and your family, could ever dream. A UNESCO wonder which needs little introduction, Machu Picchu was the legendary city of the Incas and is, nowadays, Peru’s highlight bar none. Whether you hike along the ancient Inca Trail over a few days, or reach the impressive gates by comfortable train, matters very little. Impressive in content and location, Machu Picchu will take your breath away. One of our world’s most important archaeological sites, this is an almost ethereal sight. Framed by peaks and sitting at an altitude of 2,430m, Machu Picchu has single-handedly put Peru on a tourist map over the last century. Nazca Lines in Peru. Photo credit: Shutterstock. Etched on the ground of Peru’s arid desert, the Nazca Lines are as entrancing as they are mysterious. Even though various elevated platforms have been erected, the best way to really absorb their size and mind-boggling precision is from a light plane, which you can take from the small town of Nazca, about 450km southeast of Lima. The ancient geoglyphs are shrouded in fables, which only adds to their appeal. Once you see the monkey, the condor and the curious astronaut, you’ll also be left with more questions than answers. 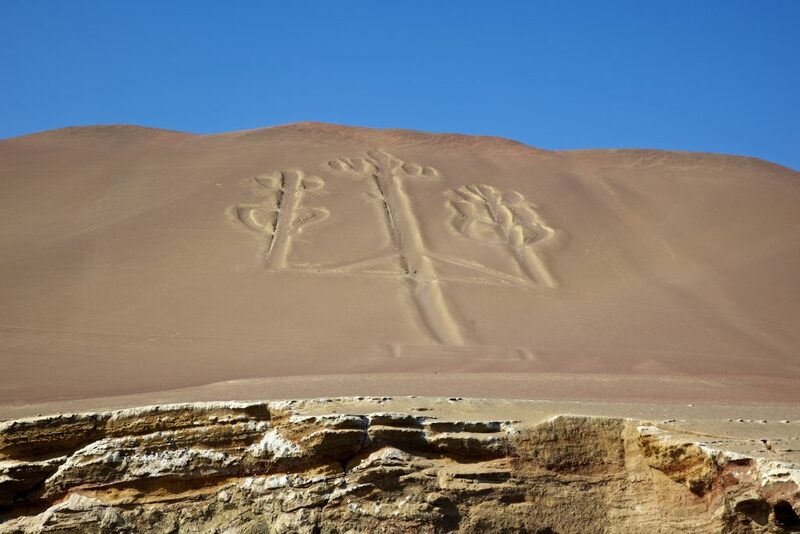 Believed to have been created over 1,500 years ago, the Nazca Lines are southern Peru’s most prominent UNESCO site and an attraction that’s super easy to include on all overland tours of the country. Arguably the most awe-inspiring waterfalls in the world, Iguazu Falls are an overwhelming spectacle of sheer natural force and therefore one of the UNESCO-listed Attractions in South America for a good reason. A gargantuan wall of cascading water, Iguazu is made up of more than 270 waterfalls, which combine to drop 100 cubic metres of water every minute, along a wall that’s more than 2.5km wide. Want to see a UNESCO site that’ll WOW your socks off? This is it! Easter Island. Photo credit: Shutterstock. On remote Easter Island, a dramatic volcanic island floating on the Pacific Ocean thousands of kilometres off the coast of Chile, is where you’ll discover the Rapa Nui National Park. This UNESCO heritage listed site is no doubt a natural splendour, yet what makes it totally unique are the hundreds of rock carved human figures with oversized heads resting on rock altars. 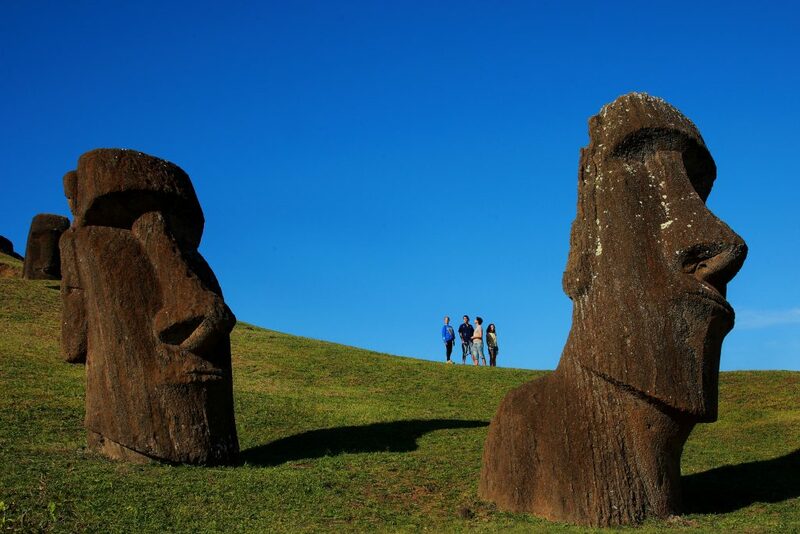 The moais were carved by the native Rapa Nui people between 400 and 500 years ago and, together with the tremendous natural attractions (snorkelling, diving or horse riding are awesome things to do here), they make for an exceptionally rewarding destination. The remoteness of Easter Island and its alienation not just from South America but from the rest of the world (this is rated as one of the most isolated places on earth) makes Rapa Nui a mystical and intriguing place to visit if an adventurous UNESCO-hunting trip is on your wish list. 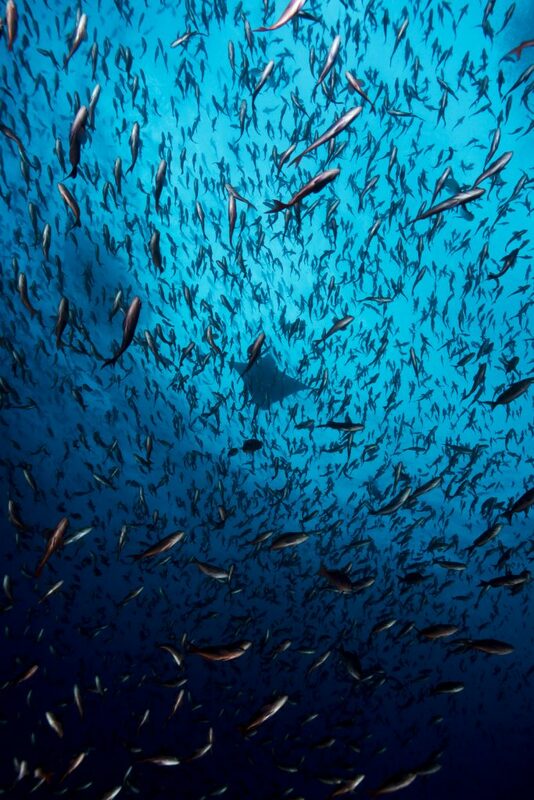 The Galapagos, An Underwater Paradise. Photo credit: Shutterstock. The Galapagos Islands are often described as ‘heaven on earth’ yet at first glance they may appear anything but lush. Volcanic in origin and mostly devoid of tropical lusciousness, the Galapagos are some of the most striking islands you’ll ever see. Yet life here doesn’t just exist, it thrives and reproduces in a myriad of ways. Magnificent in every way, the Galapagos are home to some of the most captivating creatures on earth, all of whom have been free to evolve without any fear of humans. This is what makes wildlife spotting in the Galapagos a nature lover’s superlative bucket-list experience. For up close and personal encounters with seals, turtles, iguanas, albatross, hammerhead sharks, rays and a gazillion more species of just about everything, the Galapagos off the coast of Ecuador are simply unrivalled and therefore deserves a spot in the top UNESCO-listed Attractions in South America. Los Glaciares National Park. Photo credit: Shutterstock. Los Glaciares National Park well deserves a spot in this top 12 UNESCO-listed Attractions in South America. Argentina’s largest national park is a place of startling beauty and one of the most important examples of glaciation on our planet. Part of the colossal Southern Patagonia Ice Field, Los Glaciares is home to astonishing natural wonders, including imposing Mt Fitzroy, Lago Argentino, and the awe-inspiring Perito Moreno Glacier (a true Highlight of Patagonia) which moves forward at an astonishing speed of 2m a day, creating thunderous ice breakoffs on a daily – if not hourly – basis. 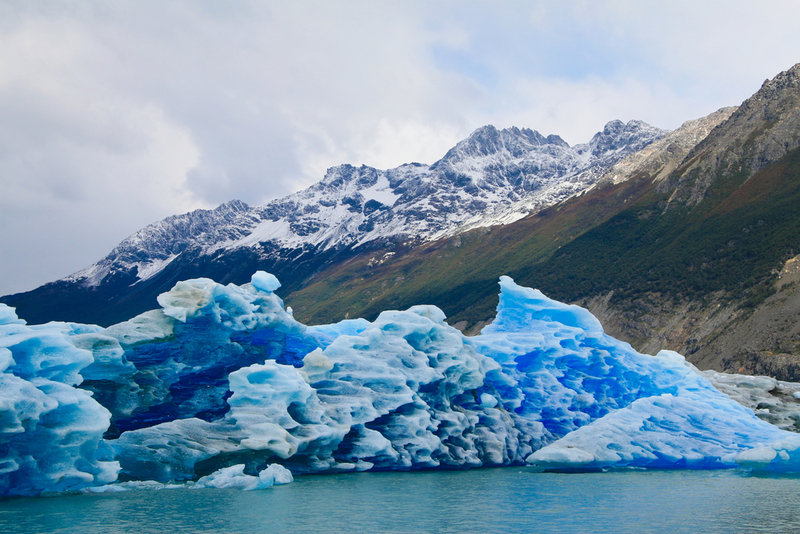 Unlike what its name may suggest, Los Glaciares National Park is not just about glaciers, however glorious they may be. Semi-arid steppes, vivid sub-Antarctic forests, and innumerable lakes are home to large colonies of endemic wildlife. What makes Los Glaciares unique and priceless, according to UNESCO, is the variety of ecosystems and wildlife found here and the fact that since much of it is unreachable, it remains untainted. 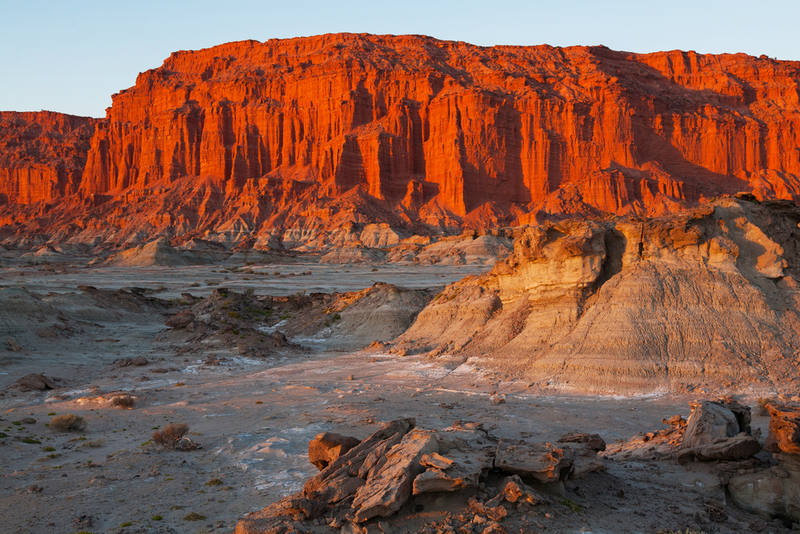 Moon Valley national park Ischigualasto, San Juan, Argentina. Photo credit: Shutterstock. The landscapes of these two adjoining national parks in central Argentina are a spectacle of breathtaking proportion, yet it’s what’s hidden within their mesmerizing rock formations that left – and continues to leave – the science world speechless. For here lies the most complete collection of fossils dating back over 200 million years, all the way to the Triassic Period. The evolution of dinosaurs, mammals and flora is forever immortalized here, in what is considered one of science’s most significant findings and therefore this is one of the 12 absolutely stunning UNESCO-listed Attractions in South America. The Pantanal Wetlands. Photo credit: Shutterstock. Another South American treasure blessed with immense eco-diversity is Brazil’s Pantanal, an extensive area of lush wetlands home to countless colonies of native birds, as well as caimans, capybaras and ever-elusive jaguars. 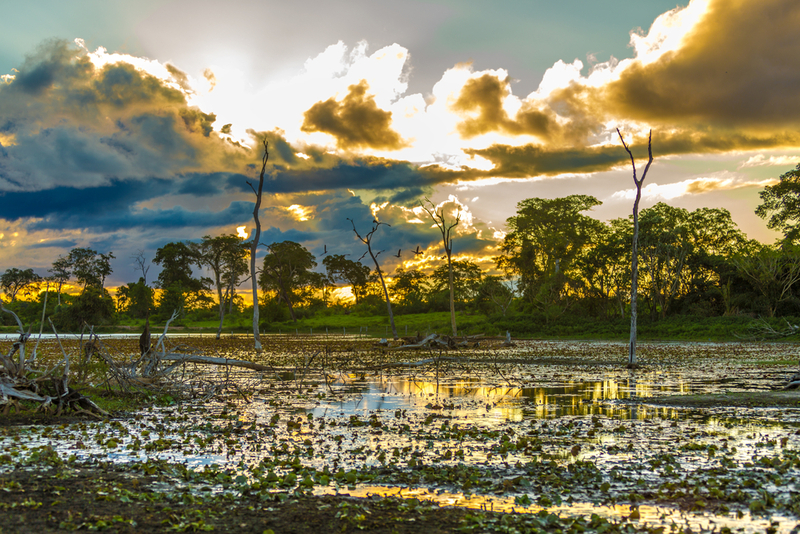 This is the largest tropical wetland region in the world and although it usually plays second-fiddle to the Amazon Rainforest in celebrity status, it is in the Pantanal that you have the highest chances of spotting wildlife, due to the lack of dense tropical rainforest. Much like the Amazon, the Pantanal is also under constant threat, yet the richness of flora and fauna, coupled with its relative anonymity, makes the preservation need much greater here. Covering a staggering area of 195,000 square km, the Pantanal is a resplendent haven of nature, one that is as difficult to forget as it is to visit. So visit Brazil you must! Bolivia boasts no less than 7 UNESCO heritage-listed sites, the most famous of which are the ruins of Tiwanaku. 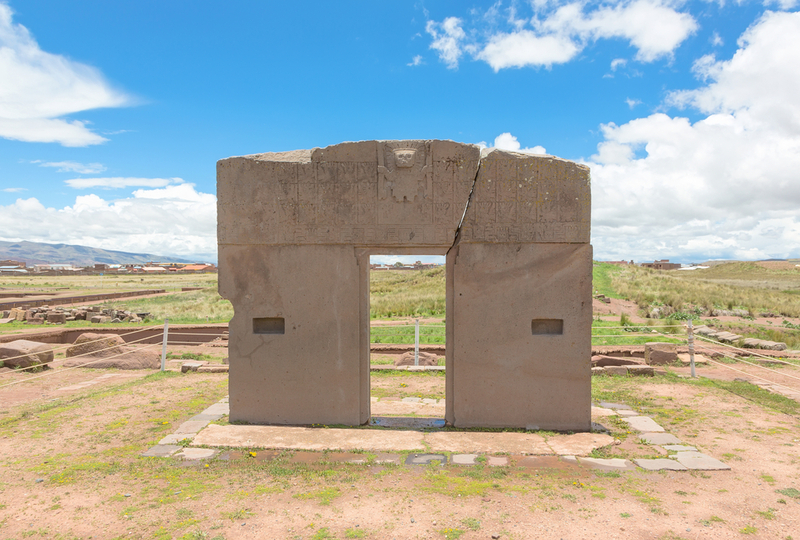 Once the spiritual centre of the Tiwanaku culture – a very powerful pre-Inca civilization which lived in the first millennia AD –Tiwanaku is considered to be one of the eminent precursor to modern society, with many experts believing this to be the oldest city in the world. Some of the monumental architecture, which includes temples, pyramids and monoliths, seem to defy the laws of physics. How or why these were built, and what their intricate carvings mean, is a mystery which has yet to be solved. Number 11 in the top 12 of the top UNESCO-listed Attractions in South America is the magical city of Cartagena. Cartagena de Indias is a gorgeous city tucked away in a picturesque cove on the Caribbean coastline of northern Colombia. Inscribed in the UNESCO heritage list in 1984, this beautifully preserved colonial town is often regarded as the most romantic city in South America, and its charismatic appeal manages to infect even the most heart-hardened cynic. 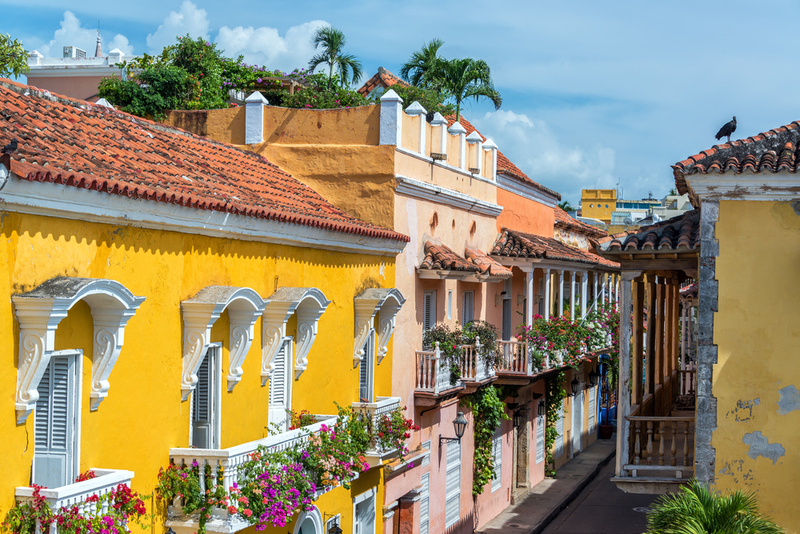 Cartagena boasts the largest and best preserved fortification in the continent, with a bevy of stone walls, forts and churches, magically transporting you to a bygone era. Worried about safety in Colombia? Don’t be! Check out our Colombia travel safety guide and discover how enriching, and safe, a tour here can really be. The Angel Falls in Venezuela. 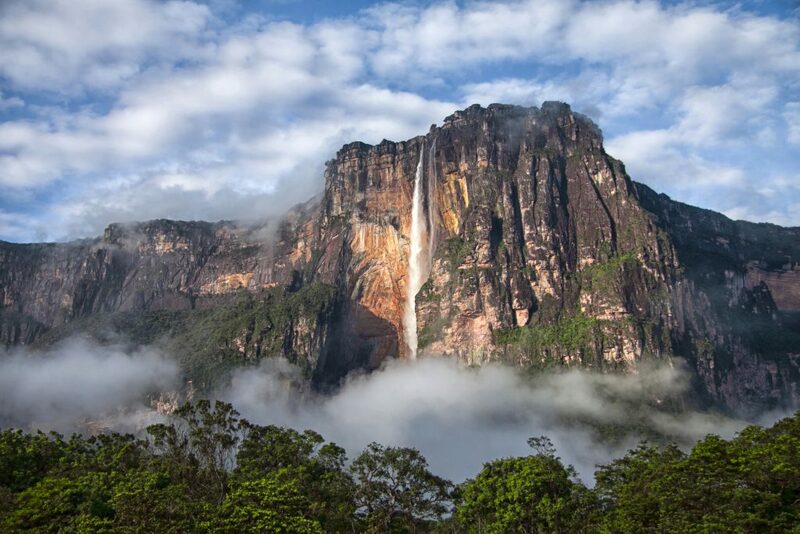 Photo credit: Shutterstock..
Last but not least on this list of the most wonderful UNESCO-listed Attractions in South America , the Angel Falls in Venezuela. 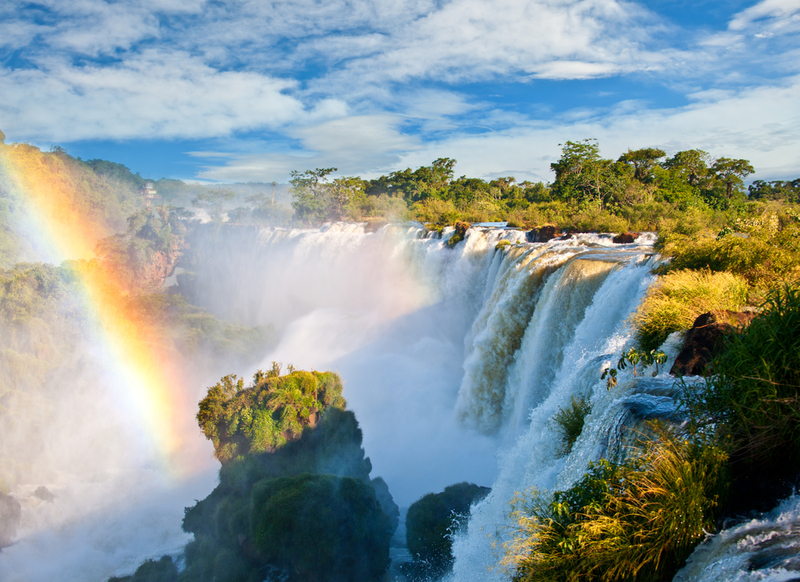 Hailed as the highest waterfall in the world, Angel – one of South America’s Five Best Waterfalls – is as heavenly to admire as her name suggests. This spellbinding cascade may not be as famously grand as Iguazu Falls, we’ll grant you that, but when you see an uninterrupted waterfall dropping almost am entire kilometre from the peak of a rugged cliff, you’ll find yourself catching your breath nonetheless. Found within the perimeter of UNESCO-listed Canaima National Park in Venezuela, Angel Falls is the most celebrated highlight of what is an immensely biodiverse region of the country. Ready to launch on an unforgettable South America adventure? Then let us guide you to all these UNESCO listed delights and more! Because for every internationally celebrated UNESCO listed attraction in this continent, there are countless more treasures that may be lesser known but are equally impressive.